The Kasbah des Oudaias was recently added to UNESCO's list of World Heritage Sites and is a pleasant place to take a stroll and admire some interesting architecture. 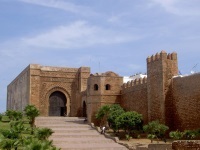 The Kasbah was the Alhomad citadel of medieval Rabat, and is guarded by an impressive arched gate built around 1195. Inside the Kasbah is the palace and Andalucian gardens, as well as a broad terrace, which gives beautiful views of the river and sea close to the city's oldest mosque, the Kasbah Mosque, founded in 1050. Below the terrace are several fortifications with gun emplacements guarding the estuary, and even further below is a beach, usually crowded with locals. The views from this ancient stronghold are marvellous, and a little café sits beside the palace, where visitors can have traditional mint tea and almond cookies while admiring the view. The winding alleys and characteristic blue and white buildings give the area a cool and peaceful allure.